Luke Marsh scored the only goal of the game as Leighton Town eat Colney Heath 1-0 to climb to seventh in SSML Premier Division. 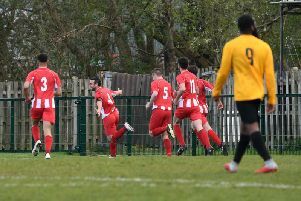 Marsh's goal early in the second half ensured Town bounced back from defeat in their last league outing against Edware last week, but the bottom club didn't make life easy for the Reds. On a hard and bobbling pitch, neither side were able to play great football. Leighton started the better sides, putting some good early pressure on the visitors and had an early half chance after Lewis McBride’s early corner was nearly met by Marsh. Leighton were looking good from set pieces in this early stage of the game and Kai Ashley made a pin point pass to Dave Murphy from a free-kick but he couldn’t direct his header on target and it sailed harmlessly wide. For the Reds it was just a case of lacking the final killer touch as both Alex O’Brien and Carl Tappin had good chances. First it was O’Brien striking a venomous shot not too far over the bar before Tappin had a better option McBride pulling back a teasing ball, all Tappin could do was blast it over the bar. Whilst at times the first half lacked quality, the visitors also had some good chances. Isi Rotini played a lovely cross to Lee Armit who skewed his shot just past the post. Ty Ward then had a good chance as he was allowed to run at the Leighton defence but Tom Wyant was more than equal to what was a tame effort in the end. It was the hosts that really should have gone ahead before half time after some lovely hold up play from Smith, he played a lovely ball to O’Brien who just struck his shot past the post. Leighton then hit the post from a cross it came it to Smith who could’ve shot but was tackled. However the hosts did get an opener early into the second half. It started with a lovely ball by James Towell to O’Brien he played it across goal which caused confusion between the Colney Heath back line as a defender headed it back to Harry Smart he snatched it enabling Luke Marsh to slot home into an empty net. The goal woke the visitors up who were perhaps unlucky not to equalise after Armit chipped Wyant but it just lofted past the wrong side of the post in what was an alarming wake up call for the hosts. Leighton had to absorb some pressure late on but Wyant was up to the task as he saved a oncoming header. Sometimes though the best form defence is attack and Jakk Pursey hit an audacious long ranged effort just over the bar. Despite this, the visitors still tried to get a goal and Towell had to make a good clearance to deny Ward. It was tense for the last few and Tom Guiney had to make a crunching tackle on Armit to deny him. The Leighton back line held firm though and denied the proverbial kitchen sink that the visitors were trying to throw and got a hard fought three points in the process.